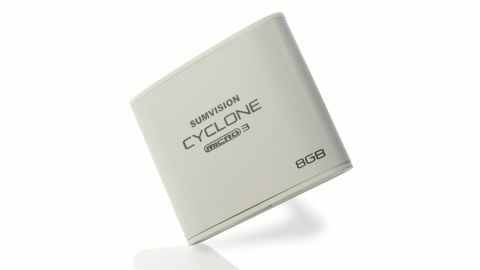 The Sumvision Cyclone Micro 3 is a media player, not a streamer. You can't connect it to your home network or to the internet, but you can enjoy movies, music and photos from a USB drive, an SD card or the device's internal memory (stated as 8GB here, but available in capacities from 2GB to 32GB). For HD viewing, there's an HDMI port (cable not supplied). You can also watch through composite video or your TV's aerial socket (cables included). Coupled with its very small size, it's ideal for taking on holiday, where you might not know in advance what connectivity your hotel TV has. It's powered from the mains or through a USB port, if there's one handy, and is FAT32-formatted out of the box. It won't recognise Mac-formatted drives, so for video files over 4GB in size, you also need Paragon's NTFS driver. The Cyclone Micro 3's user interface and bundled remote are easy to use. It played every video format we threw at it (except DRMed iTunes movies) - even Video_TS folders ripped from DVDs. Folder trees are preserved, making navigation so much easier, and you can resume play on a part-watched video. We've a few minor grumbles. Unless you clean-eject your thumb drive, resource files are displayed. The music player is a little basic, with no facilities to sort music according to factors such as artist or genre, and there's no means of copying from external storage to its internal memory. Even so, it comes highly recommended for those who want a media player but have no need for network or internet streaming.